Want to make a giant impact in your garden? Try using the “Short, Medium, Tall Garden Bed Technique” in your gardens this year. Above you see a photo I took several years ago at the Dallas Arboretum which demonstrates the technique quite nicely. In the front, along the border of the garden you see the ornamental grass planted in a thick layer. Next is a medium height plant. Impatiens are seen in the photo, but you could easily use a medium height zinnia or Angel Mist Angelonia which seem to tolerate Houston heat better. The tall middle layer is Colocasia in this photo. It would be easy to substitute Russian sage, a tall native grass, or drought tolerant ornamental grass in its place. 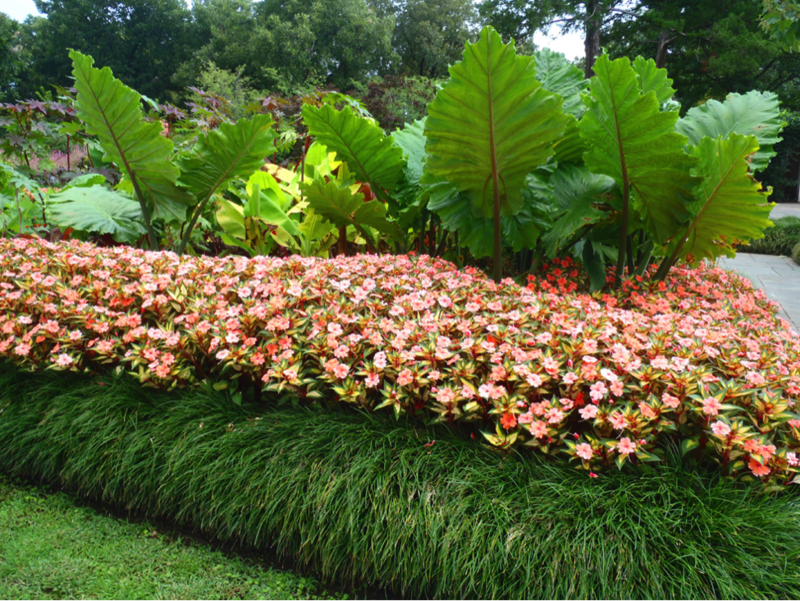 This technique works for borders with a wall backing the planting, in island-style planting, or along paths as you see above. Happy garden designing – spring is coming! You could have told her before you ever met, that you'd like hainvg coffee that day, and that you'd promised to be at that party at whatever time it was. If it sounded like an escape plan, so what? You'd never even met.Anyway, how many parties are too important to miss if you're with a really special person? That part is up to you, and you can even set a definite date before you leave for the party.She made an unfortunate mistake though. I'd have asked if you were expecting me to spend a whole nother hour there just to have a sandwich.